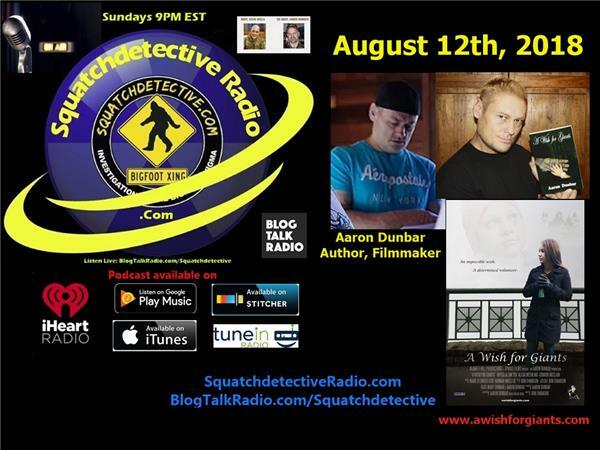 Join us live Sunday, 9PM Eastern on BTR as Chris and Steve talk with Aaron Dunbar, author of the book and now film: A Wish for Giants. Wish for Giants was a novel Aaron wrote and published in 2015. It was originally written as a fundraiser to help children with life threatening medical conditions get their wishes granted. The story is about a young girl named Roxie Madison with an inoperable brain tumor and a very unique wish--to FIND Bigfoot! Aaron hoped the book would be successful but had no idea how huge Bigfoot pop culture really was. After meeting a handful of celebrities within the Bigfoot world, who eagerly bought my novel, Aaron was encouraged to make it into a movie. With much contemplation... and prayer...and support from his wife...they began to make this vision a reality.